In 1955 the contract from the United States Government for the development of an IRBM (Intermediate Range Ballistic missile) system went to the Douglas Aircraft Corporation, which by prodigious feats of design and engineering delivered the first SM – 75 Thor in October 1956 and despite an inauspicious start in the flight test programme – the first 4 launches ended in failure – the system was declared operational in 1959. From the beginning it had been the intention of the United States government to deploy Thor missiles in Britain. This proposal was put forward in January 1957 to the British Defence Minister, Duncan Sandys, who was a firm advocate of ballistic missiles, and who was deeply involved in the development of Britain’s own IRBM, Blue Streak. 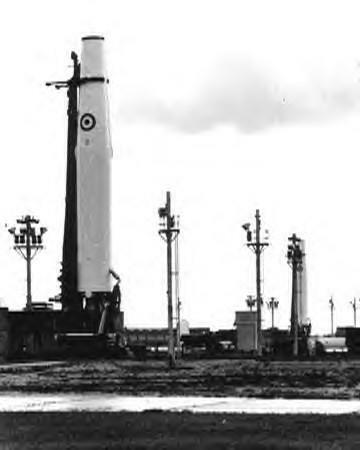 The latter weapon, however, was not expected to be ready for development for some years (in fact it was never to be deployed at all) and the prospect of an interim IRBM deterrent in the form of Thor seemed attractive. Thor, the Americans emphasised, would cost Britain nothing except the funds necessary for site preparation, and to avoid political complications the weapons would be manned by the Royal Air Force, though the nuclear warheads would remain under American control. The proposal was regarded favourably by Britain’s new Prime Minister, Harold Macmillan, who saw it as an indication that Anglo – American relationships were being restored after a serious deterioration in the autumn of 1956, when British and French forces had jointly invaded the Suez Canal Zone of Egypt. Final agreement on the deployment of Thor in Britain was reached at the Bermuda Conference of March 1957, when Macmillan and Eisenhower met to discuss key issues. On 1 April, Macmillan reported to Parliament that: ” The rockets will be the property of Her Majesty’s Government, manned by British troops who will receive their prior training from American experts. The rockets can not be fired by any except the British personnel, but the warhead will be in the control of the United States – which is the law of the United States- and to that extent the Americans have negative control; but it is absolutely untrue to say that the President and not the British Government will decide when these missiles will be launched and at whom. So long as we rely upon the American warheads, and only so long, that will remain a matter for the two Governments”. So despite considerable opposition from various quarters – not least the members of the public, who were gradually becoming organised in their expression of disapproval of nuclear weapons – plans for Thor deployment went ahead, and in February 1958 a joint government agreement was signed. It provided for the Third Air Force to assist in the construction of the Thor sites and deliver the missiles to the RAF, which would maintain and control them, while targeting was to be a matter of joint operational policy, relying on the close liaison established between the US Strategic Air Command and RAF Bomber Command. The plan was for sixty Thor rockets to be supplied to Britain, with twenty reformed Royal Air Force squadrons operating three missiles each. After its number, each squadron would carry the initials SM (Strategic Missile) – the only RAF squadrons ever to bear this designation. The first of the designated squadrons, No. 77(SM), was reformed at Feltwell in Norfolk on 1 September 1958, as yet without missiles, its task was to establish training techniques and procedures with the USAF. Prior to April 1959 the US research and production facilities had been directed mainly towards proving the Thor weapon system at White Sands, New Mexico and Cape Canaveral, Florida, and to setting up the first two missile sites in the United Kingdom. Very little equipment was dedicated to training, and it was not until 16 April 1959 that a RAF crew of No. 98(SM) Squadron, having received formal Integrated Weapon System training, became the first to launch a Thor. Launch crews comprised a Launch Control Officer, usually a RAF Flight Lieutenant of the General Duties Branch; plus various ground crew technicians; and an American Authentication Officer, with the rank of Captain in the USAF. The Squadron Commander was a RAF Squadron Leader, also of the General Duties Branch. The Royal Air Force launch crews were trained at the Douglas Aircraft Company school at Tucson, Arizona. Training comprised missile theory, construction and operation, and an introduction to the necessary ground support equipment. A realistic simulator was used for instruction in countdown sequences, and malfunctions could also be incorporated for emergency training. On graduating from Tucson the crews moved to the home of the USAF’s 1st Missile Division at Vandenburg AFB, California, where more detailed training using operational equipment was conducted by the 392nd Missile Training Squadron, assisted by instructors of the Douglas Aircraft Company. On 19 September 1958 No. 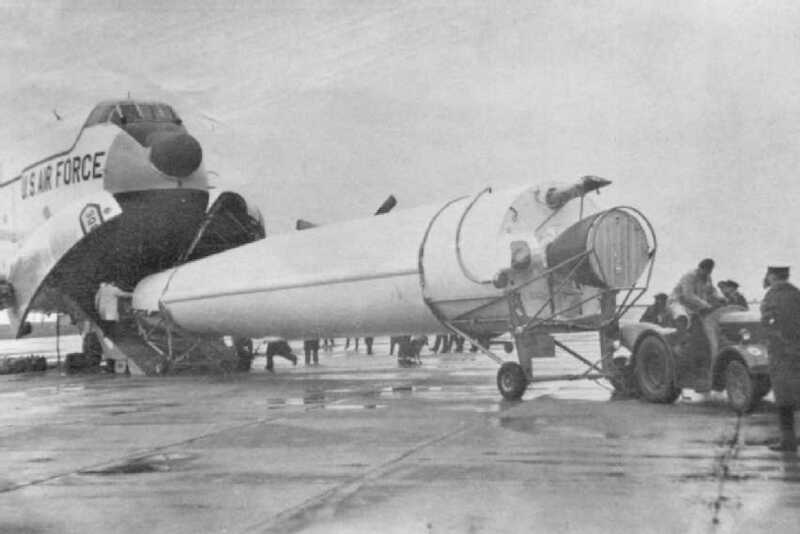 77(SM) Squadron received its first Thor missile, which was flown to Feltwell aboard a USAF C-124 Globemaster, and all subsequent missiles were delivered by this means, along with their ancillary equipment. The missile was still being operationally proven as a weapons system however, and nearly a year was to elapse before the next batch of RAF squadrons was declared operational with the Thor, on 22 July 1959. These were No. 82(SM) at Shepherd’s Grove, Suffolk, No. 104(SM) at Ludford Magna, Lincolnshire, No. 106(SM) at Bardney, also in Lincolnshire, No. 107(SM) at Tuddenham, Suffolk, No. 113(SM) at Mepal, Cambridgeshire, No. 142(SM) at Coleby Grange, Lincolnshire, No. 220(SM) at North Pickenham, Norfolk, and No. 269(SM) at Caistor, Lincolnshire. Five more RAF Thor units became operational on 1 August 1959, all of them in the East Riding of Yorkshire: No 98(SM) at Driffield, No. 102(SM) at Full Sutton, No. 150(SM) at Carnaby, No. 226 at Catfoss and No.240(SM) at Breighton. And it was the end of the year before the six remaining squadrons reached operational status – No. 97(SM) at Hemswell, Lincolnshire, No. 130(SM) at Polebrook . Northamptonshire, No. 144(SM) at North Luffenham, Rutland, No. 218(SM) at Harrington, Northamptonshire, No. 223(SM) at Folkingham, Lincolnshire and No. 254(SM) at Melton Mowbray, Leicestershire. Despite the secrecy surrounding the location of the Thors, people in sleepy little towns and villages stretching in an arc from Yorkshire to Suffolk did not take long to realise that, in the space of just a few months, they had jumped into the front line of NATO’s nuclear arsenal and would be the first to be hit by an enemy strike if war broke out. Not that the three missiles at each location were much in evidence to the casual onlooker; for much of the time they lay prone and invisible in their shelters, behind heavily guarded perimeters, emerging only for practice countdowns. Phase 2: Shelter retracted and missile erected. Targeting data entered. Phase 4: Missile functions transferred to internal power source and missile topped up with liquid oxygen (LOX) if required. Phase 5: Authentication launch codes received. Keys turned and engines started. During the launch sequence a phased hold could be introduced leaving the missile 6 minutes from lift off in the fuelled position. The operational control of the Thor, covered by an understanding between the British and US Governments was achieved by a dual key system whereby the RAF could initiate a countdown but the launch could only be achieved after the USAF officer armed the warhead. This satisfied both the British and US Governments veto over the launch of the missile. Whilst the British key initiated the missile launch sequence and the American key armed the warhead there was speculation whether the American veto could have been overridden in extremis. The answer to this was yes, but it was virtually inconceivable that the British veto could be overridden. There was never any suggestion that any RAF personnel contemplated such action. 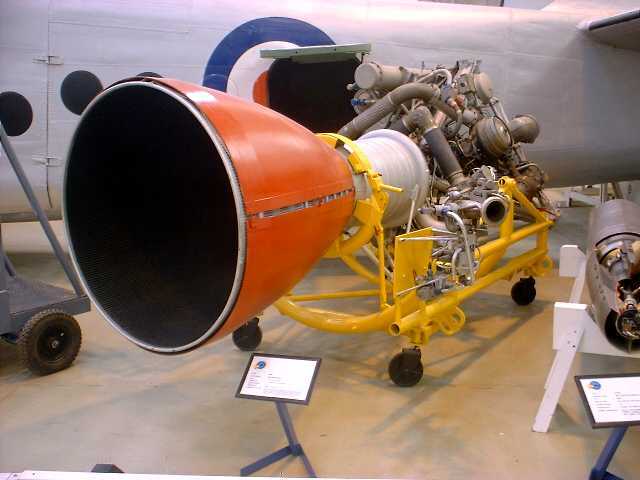 The liquid fuel rocket motor was in fact the Thor’s principal disadvantage, and the time needed to bring the weapon to operational readiness made it vulnerable throughout its career with Bomber Command. Further time would have been needed to fit the nuclear warheads, which were not kept on site but stored with the other V Force weapons under extreme security at Faldingworth, an old wartime airfield near Scampton, Lincolnshire. Such was the secrecy surrounding Faldingworth that from 1956 to 1980, the airfield was not shown on Ordnance Survey Maps. Spare parts for the Thors in the UK were held in the United States; and RAF squadron supply officers could indent direct by radio link for spares and receive them immediately by air, as all the equipment could be carried by the C-124 Globemaster. Impressive though it was, the Thor deployment in the United Kingdom was nothing more than an interim measure and was scheduled to terminate in November 1964. However it was actually terminated in 1963, when the USAF had deployed its first ICBM (Inter continental ballistic missile), the Atlas. At the same time, the RAF’s V Force of Valiant, Victor and Vulcan bombers had reached a new peak of effectiveness with its own deployment of the Blue Steel stand off weapon, which equipped several squadrons, and the Thor squadrons were disbanded, most of them for good. The Thor intermediate-range ballistic missile is now able to take its place as part of the operational front-line of the Royal Air Force. The Secretary of State for Air announced this in the House of Commons on December 9, 1959. The build-up of the force is nearing completion. That this stage has been reached within two years of the signing of the Inter-Government Agreement is a measure of the degree of co-operation between the United States Air Force and the Royal Air Force. All spare parts for the Thor missiles system are supplied from the United-States Thor bases are in direct Communication with a base in California, which is the Central Co-ordinating Authority for recording the consumption and issue of spares. A computing machine keeps up-to-the-minute stock records and when any items falls below a certain level, re-supply is set in action automatically. In the case of an urgent demand for spares, Caused by unforeseen circumstances, these are despatched from the U.S.A. by the first available air transporter Civil or military. Complete Thors are initially delivered to the United Kingdom by Douglas C-124 Globemasters and C-133 aircraft of the U.S. Military Air Transport Service. The general understanding between the U.S. and the U.K. was set out in a white Paper entitled “Supply of Ballistic Missiles by the United States to the United Kingdom” to Parliament in February 1958, which stated that the United States would supply the missiles and specialised equipment and would provide training assistance; for its part the United Kingdom would man and operate the missiles and also provide the sites and supporting facilities. The Paper also referred to the system of control which the two Governments would exercise over the operation of the force, and specified arrangements for making the warheads available. THE THOR WITH THE R.A.F. The Thor missile squadrons are grouped around four main bases of which Feltwell is one. All sites used in this deployment are old airfields, some of which have had a long association with the R.A.F. Feltwell, for example, has been an airfield since 1917, whereas some of the satellites housed the wartime heavy bombers. The main base (or complex) houses all the major servicing equipment and facilities for receipt inspection and maintenance; the satellites are little more than launch emplacements. A squadron at each of the satellites maintains three Thors, making a total of 15 per complex. Each Thor complex is manned by about 1,000 officers and men. The base commander is a Group Captain. He has three Wing Commanders (Operations, Technical and administration) – an organisation on conventional R.A.F. lines. Here, however, the division between units is less precise than in flying units. There is need for the closest co-ordination and co-operation between the Operations and Technical Staffs, while the Administrative Staff must function so that it can deal with the day-to-day domestic details of problems of men engaged on working a shift system covering 24 hours a day seven days a week. All personnel have been trained in the United States at a series of manufacturers courses. Because of the rate at which the Thor programme was introduced, training for the squadrons for the first two bases, while being adequate for the introduction of the system into the R.A.F., was not complete. It must also be emphasised that while these squadrons were being trained the Thor missile was still under development. The training for these squadrons has since been completed in this country by American Field Training Detachments thus supplementing their initial training and bringing them up to date on missile development. The training for the remainder of the force took place in the United States and was made under an Integrated Weapons System Training Plan, culminating in actual firings from Vandenberg Air Force base, California. Training of these squadrons in the U.S.A. was completed during January 1960, but continuation training will, of course, go on in the United Kingdom as part of the normal activities of the Thor squadrons. Some 50 R.A.F. N.C.Os. are at present undergoing further training in the United States as instructors so that they can supervise this continuation training programme. These 50 instructors will also be responsible for the future ab initio training of replacement personnel in R.A.F. Technical Training Command during the life of the system. In addition, launch crews and technical personnel periodically return to Vandenberg to launch missiles as part of a combat-training launch programme. The broad object of this programme is to demonstrate the effectiveness of the missiles and their crews. The Officers and N.C.Os. forming the launch crews and manning the Operations Room are mostly aircrew members serving a tour of duty in the guided-weapons force. A large proportion of the technicians in the force are N.C.0’s. with very considerable experience in aircraft maintenance. These men were specially chosen for their ability and made an extremely favourable impression on the U.S.A.F. during their period of training. In 1955 the U.S.A.F. decided to build an intermediate-range ballistic missile (IRBM) to be in service as quickly as possible. Douglas Aircraft was made the prime contractor for the system – the SM-75 – which became the Thor. The company designed the Thor as a production missile from the outset; long before the complete missile had been assembled, experimental development XSM-75s were being produced on an assembly line using production tooling. 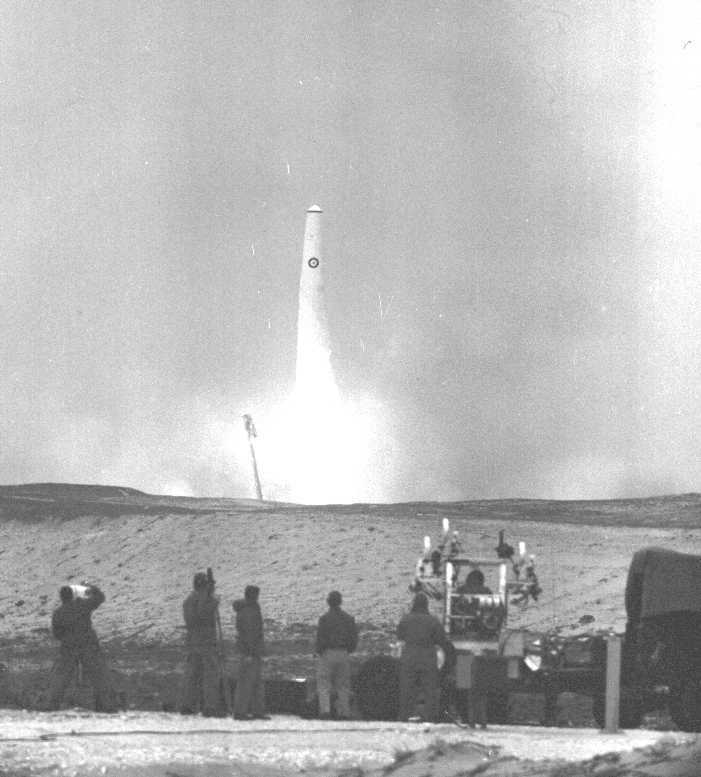 The programme followed a technique in which a widespread and intensive programme of testing was used to ensure that each development missile was slightly nearer to the operational weapon than its immediate predecessor. By doing this, the Douglas company was in a position to deliver in bulk at a relatively early date. The first experimental XSM-75 was fired in January 1957. This firing was unsuccessful as the missile rose only a few inches before falling back, exploding. 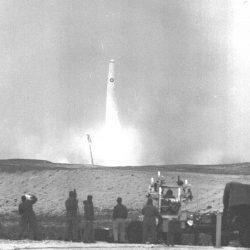 The next four firings were also failures for various reasons, but on September 20, 1957, the sixth experimental Thor accomplished a 1,300-mile flight and provided excellent telemetry results. Up to the end of January, 1959, 24 Research and Development missiles had been fired. Of these, ten could be considered successful, four were partially successful, and ten were failures, though all yielded valuable information for the Thor development programme. From February 1959, to date a further 22 R and D. missiles have been fired, of which 20 were successful, one partially successful, and one was a failure. In addition some 20 Thors have been used in one form or another in the U.S. Space Programme. The Thor has a maximum range of 1,500 nautical miles(1,727 statute miles) which has been proved in test firings. The missile is 65 ft. long, and 8 ft. in diameter; it has an all-up weight of 110,000 lb. Of this weight, 98,500 lb. constitutes the fuel . The remainder of the missile is comparatively light – the skin has a thickness of only 1/20 of an inch. The missile is propelled by a single Rocketdyne MB-2 liquid propellant rocket motor which burns for just under three minutes, producing a nominal sea-level thrust of 150,000 lb. To obtain precise control under powered flights two small Rocketdyne vernier motors are also fitted. While the missile is on the ground it is normally kept inside a shelter which is flanked by the tanks storing paraffin and liquid oxygen. Electrical power is constantly fed to the missile keeping the gyros in the inertial-guidance system in a state of readiness. The condition of the missile is constantly monitored in nearby trailers by a number of indicators which are fed from the missile while it is stored in the horizontal position in its shelter. Once a countdown is initiated, either for practice or for operational reasons, an automatic sequence of events follows, during which the shelter is moved aside and the missile is erected and fuelled The transporter/erector on which the missile was supported while horizontal is then lowered and the missile is ready for launching. Information Division, Air Ministry, Whitehall, London, S.W.1. This project consisted of four separate complexes. It was the first of its kind to be completed anywhere and the continuing development of the missile and its system which occurred during the course of the work necessitated modification of the work. This was particularly evident in the construction of the first two complexes. (f) An astro-geodetic survey within and without the site. 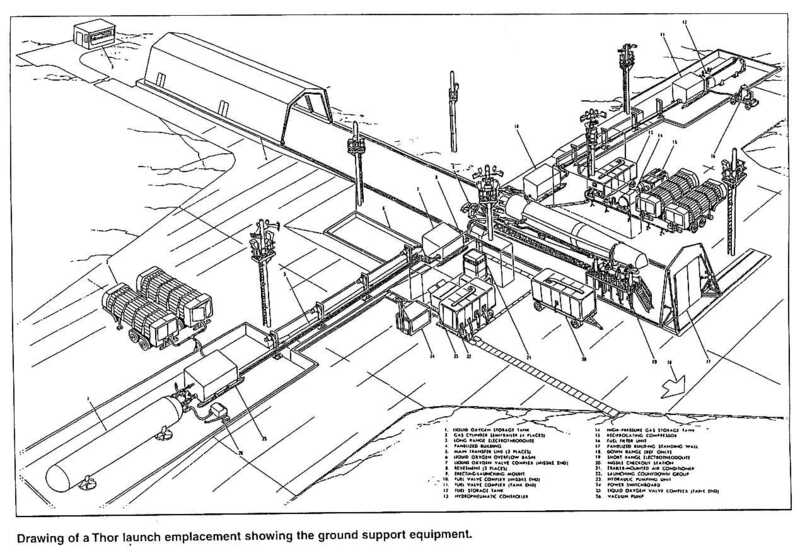 All this work was required to be completed very quickly and in addition a high standard of accuracy was essential in the alignment and levels of the launching pads Agreement was reached on the requirements on January 20, 1958, and the last base was handed over for installation of the missiles on January 28, 1960. Selection of sites was complicated by the very strict criteria laid down, the short time allowed, and by the need to use land already occupied by the Services. Each main base was located on an existing permanent R.A.F. station to avoid construction of living accommodation, and the subsidiary bases were sited on disused war-time airfields. As much use as possible was made of the existing runways and tracks for access to the launching pads. In conjunction with the Ministry of Transport and the County Councils, routes between each main base and its subsidiaries had to be surveyed to ensure that the missiles could be easily transported. In a number of cases work was necessary to ease bends in the roads. Sketch drawings of the basic requirements were provided early in February, 1958, and from them a complete set of more than 300 working drawings was prepared by April 21, 1958, for the first complex. It was also necessary to make gravimetric and astro-geodetic surveys both inside and outside the sites. The Director of Military Surveys, War Office, accepted the task outside the site boundaries while the work within the site was done by the Americans for the first two complexes and by the Air Ministry Works Directorate for the other two. The quantities of excavation and filling required varied from site to site according to ground conditions and topographical features, but the construction of the four complexes involved approximately 600,000 cu. yd. of excavation; laying and consolidating 400,000 cu.yd. of selected fill; 80,000 cu.yd. of base concrete; laying 60,000 cu. yd. of vibrated concrete; and 90,000 cu.yd. of high-quality concrete – to very fine tolerances on finished levels – installation of a steel framework, and 18,000ft of steel rails, again to very accurate criteria in line and level; construction of fuel-tank pits and cable and fuel-pipe trenches. To meet the requirements for no settlement it was necessary to pile some sites and a total of 490 piles were driven. At each main base an aircraft hangar of 45,000 sq.ft. floor area was adapted to provide a RIM (Reception-Inspection-Maintenance) building for maintenance and technical facilities. Full air conditioning was installed; dust-proof floors were provided in the more important areas, and internal partitions to divide up the floor area. The big problem was the co-ordinating of all building trades and electrical and ventilating engineers so that the work could be completed in the very short contract period. The electrical services to the launching pads included standby generating plant 200 KVA frequency changers to convert U.K. current to American standards, extensive earthing system for each pad and the floodlighting of the platforms and security fence. In the RIM building provision was made for several different power supplies besides the normal electrical distribution and power. High-pressure air and nitrogen systems were installed as well as overhead cranes. 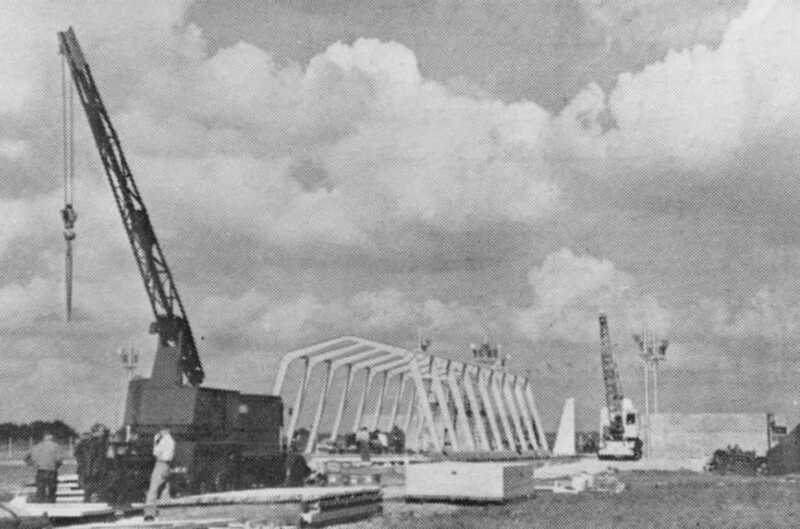 The main contract for the first complex was accepted on May 12, 1958, less than five months after inception of the scheme; 32 months later the three launching pads and the RIM building at the main base were handed over for missile installation; construction at the last site in this complex was finished at the end of December 1958 only 72 months after work began, despite bad weather during that period. Meanwhile work had started on the second complex on July 17, 1958 and was completed on April 30, 1959. The contract for the third complex was accepted on December 22, 1958, and completed on September 29 1959. The fourth complex was begun on April 16, 1959, and completed on January 28, 1960. All this work was finished to a high degree of accuracy, the allowable tolerance was an eighth of an inch in line and level, and completion in the limited time allowed could not have been achieved without close co-operation between the Air Ministry Works Directorate, the U,S. Air Force, the Royal Air Force and the contractors concerned. Information Division, Air Ministry, Whitehall London, S.W.1. Air Marshal Sir Kenneth Cross, K,C.B., C.B.E., D.S.O., D.F.C., has been Air Officer Commanding – in – Chief, R.A,F. Bomber Command, since May, 1959. Born at East Cosham, Hampshire, in October, 1911, he was educated at Hilsea College, Portsmouth; Havant High School, and Kingswood School, Bath. He entered the R.A.F. with a Short Service Commission as a Pilot Officer in 1930, and after learning to fly with No. 3 Flying Training School at Grantham, was posted to No. 25 (Fighter) Squadron – the celebrated acrobatic unit – flying Hawker Furies at Hawkinge, in 1931. He took a course at the Central Flying School at Wittering in 1934, and was then posted as a flying instructor to No. 5 Flying Training School, Sealand. The next year he was instructing with the Cambridge University Air Squadron, and in 1938 was at Headquarters, No. 12 Group, Fighter Command. Shortly after the outbreak of the War in 1939 he was appointed Squadron Leader, to command No. 46 Squadron, which was one of the two squadrons deployed to Norway following the German invasion of 1940. His Hurricanes were the first to land and take off from a carrier – the “Glorious” – which was later sunk during the evacuation. Squadron Leader Cross was reported missing as a result, but was rescued after three days on a raft. In 1941-42 he commanded No. 252 Wing in Egypt, and then No. 258 Wing during the Western Desert offensive; in April, 1942, he was appointed to command No. 219 Group, charged with the defence of the Nile delta. Following the fall of Cyrenaica to the Allies he was appointed A.0.C. No, 212 Group, Cyrenaica, and in February 1943, A.0.C. No. 242 Group in Tunisia. This Group, with the 1st British Army, was responsible for the taking of Tunis, and later became an independent Group with Headquarters in turn at Bizerta, Palermo, and Taranto. Before the invasion of Europe he was appointed Air officer, Training, at Headquarters, Allied Expeditionary Air Force, and then became Director of Operations at the Air Ministry. In 1946 he took a course at the Imperial Defence College, and in 1949 was appointed to command R.A.F. Horsham St. Faith. He took a refresher Course at Finningley, and in 1952 was appointed Director of Weapons at the Air Ministry. He became Director of Operations (1 ) in 1953, and in January, 1956, took command, as Air Vice-Marshal, of No. 3 Group, R.A.F. Bomber Command. It was at this period that the Valiant V-bomber force was being built up, and the first Victor and strategic missile squadrons were formed within the Group. Sir Kenneth flew as co-pilot of a Victor to attend the U.S.A.F. Strategic Air Commands bombing and navigation competition in October, 1958, and on the return flight flew from Labrador to Marham in 4 hr. 1 min. In October, 1959, he commanded the Victor detachment which visited Tehran on the occasion of the Imperial Iranian Air Force Day. He was knighted in June, 1959, and has also received decorations from the President of the United States, H.M. the King of Norway and H.M. the Queen of the Netherlands. He represented the R.A.F. at rugger and golf for several years, and captained the rugger team in 1934-35. Sir Kenneth is married and has three children. THE AIR OFFICER COMMANDING NO. 3 GROUP. R.A.F. Air Vice-Marshal Michael Harington Dwyer, C.B.E., was appointed Air Officer Commanding No. 3 Group, R.A F. Bomber Command, in May, 1959. He was previously Senior Sir Staff Officer of No. 3 Group, from March, 1956, and before that held a similar post at No. 1 (Bomber) Group for two years. Born in Kensington, London, in September 1912, and educated at Oundle, he joined the R.A.F. in 1931. He took the specialist armaments course in 1936-37 and most of his wartime posts were concerned with armaments. At the outbreak of war he was on the armaments staff of Training Command and later went to No, 81 Group. In February, 1943, he took command of No. 456 Squadron, Royal Australian Air Force, and later that year joined the Central Gunnery School. In August, 1945, he joined the armaments staff of H.Q., British Air Forces of Occupation, Germany, and the following year commanded R.A.F. Station Lubeck. After taking the course at the R.A.F. Staff College he was appointed a Deputy Director of Weapons at the Air Ministry in January, 1948. In 1949-51 he was in the Middle East, there he commanded R.A.F. Stations, Kabrit and Fayid. Group Captain Patrick P. W. Sands, M.B.E., D.F.C., was appointed Officer Commanding R.A.F. Station, North Luffenham, on September 9th last, on returning from Thor missile training in the U.S.A.
Born in Kensington, London in 1915, he attended Heath Clark School and joined the R.A.F. in 1936. He served in Egypt in 1937 returning to Feltwell in 1938, Subsequently he instructed on Wellington bombers at Harwell, Berks., in 1939, and in 1940-41 completed his first operational tour on Wellingtons, flying from bases in Britain, Malta and Egypt, latterly as a member of the Desert Air Force. Returning to Britain he took a course at the Central Flying School which was then at Upavon Wilts., before serving as a flying instructor at first South Cerney, Glos., and then Upavon until August, 1942, That month he began his second operational tour on Wellngtons in Bomber Command, finishing it in North Africa eight months later. In 1943 he took the Army staff Course at Camberley and in October that year joined the staff of H;Q. Bomber Command as an Operations Officer for two years, and later commanded a Bomber Command Operational Conversion Unit. From 1946 to 1949 he was in Egypt, first commanding a flight of No. 70 Squadron, at Fayid, Canal Zone, then on staff duties at H.Q., Mediterranean and Middle East. Group Captain Sands served as Command Intelligence Officer Bomber Command from June 1949 to August, 1951, before becoming Chief Flying Instructor at R.A.F. Lichfield and R.A.F. Pershore, For almost three years from February, 1954, he was Air Adviser to the United Kingdom High Commissioner in Pakistan, before returning home to join the Department of the Air Member for Supply and Organization at Air Ministry, whence he was posted to his present appointment.